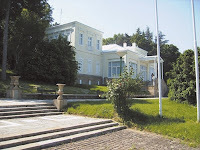 Former summer residence of the Serbian ruling family of Obrenovic, known also as „the King’s vineyard“, was a country house of the princely couples Miloš and Ljubica, Mihailo and Julia, as well as the royal couples Milan and Natalia and Aleksandar and Draga Obrenovic. It is situated in the most beautiful location in Smederevo region, on Plavinac hill, from which there is a spectacular view on the Danube and Banat plains. The 36 ha large estate was purchased by Prince Miloš Obrenovic in 1829. Dating from that period is a plane tree named after him, a stone that the Prince used for horse-mounting and a night table, his gift to Princess Ljubica. The appearance of the villa during the reign of Prince Michael was described by the Austrian travel writer Felix Kanitz. Around a modest ground floor pavilion with a salon and other buildings, the Prince planted about 2,000 vines. When he had not been getting on well with his spouse, Princess Julia, he used to find refuge in the villa in Smederevo. The estate had a golf course, tennis courts and a croquet field, as well as a horse stable. The Prince also established a three hectares park with rare specimens of cedar, Russian olive, magnolia, Judas tree, black pine, chestnut and plane tree. Just like British lords, he loved reading newspapers in a specially made iron-cast baroque gazebo in the middle of the park. The villa became a true royal resort during the reign of King Milan and Queen Natalia. After their divorce the entire estate became the property of Natalia, and in 1897 she engaged the famous Serbian architect Jovan Ilkić to renovate the quite modest-looking villa. By adding two wings with wooden balconies and a central double staircase with exquisite wooden carvings, the villa acquired then modern French-Swiss style, and a total area of 1,200 sq/m. Two representative halls were built in the central part of the ground floor – winter and summer, with French windows. 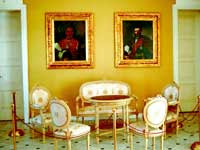 The interior was enriched with period furniture made in Vienna. It was Queen Natalia who introduced a true court protocol in the villa. The salon, paved with marble, has gilded furniture and portraits of two Serbian princes - Miloš and Mihailo, and two kings – Milan and Aleksandar. There are two sumptuous apartments upstairs, which belonged to the old and young king. According to Queen Natalia’s letters, it was in the Smederevo villa that she learned about her son’s wedding to the lady-in-waiting Draga Mašin. The new royal couple used to come to Plavinac to hide from prying eyes of the judgmental public. There they organized parties that were attended by famous Serbian writers and artists like Milan Rakić, Laza Kostić, Milovan Glišić, Stevan Sremac, Branislav Nušić, Paja Jovanović, Marko Murat and Vlaho Bukovac. The desk of Milan Rakić at which he wrote poems is still in the villa, but his writings are regrettably lost. The royal couple spent their last summer in the villa in 1902. Ana Lunjevica, Queen Draga’s sister, wrote in her memoires that the King liked playing croquet, and that the couple went swimming in the Danube. After the assassination of Aleksandar and Draga in 1903, the sole heir of the Obrenovic estate became Queen Natalia. She bestowed the Smederevo estate to Colonel Antonije Orešković, commander of the Drina division of the Army. 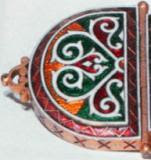 Her daughter Mica Cukić was the lady-in-waiting to Queen Draga, and he himself was an Obrenovic dynasty loyalist. The estate consisted of 30 ha of land, the villa and all of its mobiliaria – furniture, paintings, library, silverware, weapons collection, the gilded carriage… It is estimated that the entire gift was worth a million Serbian dinars in gold. The villa remained in property of Oreškovič family until 1945. After the WWII it became a representative residence of the then regime in Serbia – completely isolated, mysterious house, off the limits to the public. During the next thirty years it served for the state protocol and was occasionally visited by the lifelong president of the republic, for whom some rooms were specially redecorated. A local legend says that he used to order a bouquet of freshly picked flowers to be placed in front of Queen Draga’s portrait every morning. 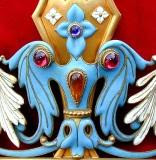 Today it is the property of the Government of Serbia. Once a remarkable structure, built on the model of the then most modern European villas, it clearly shows the traces of time. Although the Obrenovic villa is undisputedly a historical building of utmost importance, it has not been classified as an official monument of Serbian culture.